Whereever I go, whenever I speak about ancient grains, inevitably someone will raise a hand and confess, with a sigh, I’d love to eat better but I’m afraid whole grains take too much time to cook. I am too busy. You know the feeling, don’t you? You heard about freekeh and farro, bulgur and buckwheat, amaranth and teff. But cooking these ancient staples at home? On a week night? Are you kidding me? Trust me, it can be done so easily that you will ask yourself why you didn’t try it long ago. Why eat boring white rice, or even brown rice, all the time if you can have a new grain on your table every week, or even every day? While I am the author of two cookbooks on whole grains, I spent the better part of my life working as a journalist, first as a reporter and editor, later as freelance writer for publications in Germany and in the US. To this day, I spend long hours on my computer, so when I step into my kitchen in the evening I’m a famished with a capital F. Still, grains are on my table all the time—for breakfast, lunch, and dinner, even for dessert. Here are three tips I learned growing up in Greece and Germany to show you how easy it is to add good grains to your meals. On busy weeknights, I use quick-cooking grains that can be on the table as fast as white rice, in 10 to 20 minutes. So many ancient grains have become available in the past few years. And most of them are gluten-free: these include amaranth, buckwheat, cornmeal or polenta, millet, and the current rock star of grains, quinoa. Don’t forget speedy Mediterranean bulgur, super-trendy farro (aka emmer wheat), and smoky freekeh (toasted green wheat). If all else fails, I just steam some whole wheat couscous which takes only minutes. So be sure to stock a few of these quick-cooking grains in your kitchen and you will never be out of good grains for dinner. I keep mine in glass jars with tight-fitting lids such as Mason jars. This allows me to see at a glance what I have on hand which helps in the rush to dinner. But, you might say, what about whole wheat berries, spelt, Kamut, and rye, all these supremely chewy grains? Good luck getting these ready for dinner! To which I reply: no worries. Just do what home makers have done for centuries: prepare a large pot of these slow-cooking grains ahead on the weekend and use them all week long for different meals. Here’s how: Soak them overnight, similar to dried beans, then simmer for 45 to 60 minutes, depending on freshness and the type of grain, while you go about your life. 1 cup of raw grain will typically yield 3 cups of cooked grain. I like to cook my grains until they are supple and plump and some of their starchy centers show. I find well-cooked grains easier to digest and more pleasing to eat. Cooked grains in your fridge or freezer, be they quick or slow-cooking, are your best weapon for whipping up dinner during a busy week. With these nutritious staples at the ready, you will be surprised to discover how creative you become in your kitchen. Toss a handful into a soup, or use 2 cups as a base for a nice salad. In summer, add chopped vegetables from the farmers market, olive oil, vinegar, salt and pepper—and voilà dinner! In winter, you can do the same by tossing cooked grains with roasted vegetables—now you have a nourishing warm grain salad. I also love spooning a handful of cooked grains into yogurt, with dried or fresh fruit and a drizzle of honey, and call it breakfast all year long. Last but not least, how long are cooked grains safe to eat? You can store cooked grains in the fridge for up to 7 days. Or freeze them for up to 3 months, preferably portion-size. Defrost grains simply overnight in the fridge, then reheat them with 1/4 inch of water, covered, over medium to medium-low heat. Or cook them, straight from the freezer, in the microwave. 1 cup of frozen grains needs only 1 to 2 minutes on high heat to be ready to eat. Now all that remains is: go get some good grains and get started. And keep me posted. I’d love to hear all your grains questions, and I mean it. Of all of the grains in my pantry, intensely nutty bulgur is my go-to choice during the week. The fiber-rich grain is pleasing in a humble way yet speedy and unfussy. One morning, I tossed in all the color I could find in my kitchen to paint my bulgur a deep reddish-blue hue. 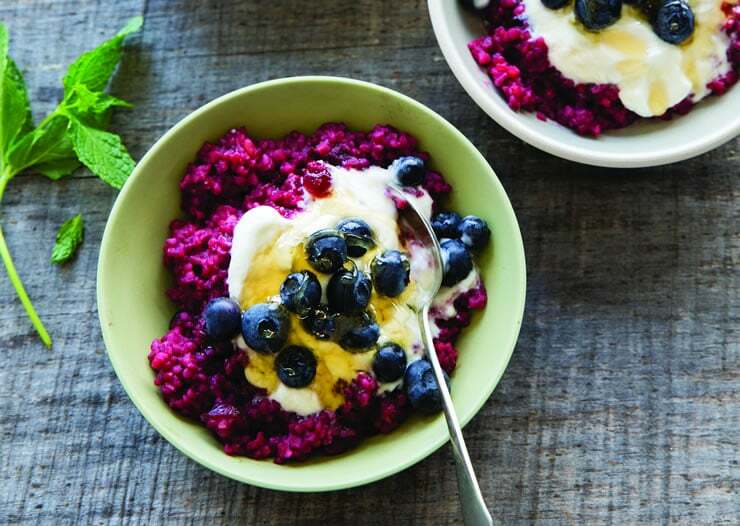 This recipe gives you two splashy breakfast variations: Unsweetened cranberry juice creates an intense burst of tanginess and a stunning dark fuchsia in your bowl in which the blueberries stand out like jewels. Pomegranate juice lets you start your day on a naturally sweeter note, with a deep burgundy hue—one is as delightful as the other. As an added benefit, this breakfast is an antioxidant powerhouse. If you have orange blossom water in your cupboard, here its fleeting floral and bittersweet scent is a boon. To make the bulgur, add the pomegranate juice, bulgur, cranberries, and vanilla to a heavy 3- or 4-quart saucepan and bring to a boil, stirring once or twice. Decrease the heat to maintain a simmer, cover, and cook for 10 minutes. Stir in the blueberries and honey and continue to simmer until the berries are warmed through, about 2 minutes. Gently stir in the zest and the orange blossom water. Taste and adjust with a bit more honey and orange blossom water if you like. Meanwhile, add the Greek yogurt and the 1 tablespoon honey to a small bowl and beat until smooth. To finish, divide the bulgur between four bowls. Top each with 1/4 cup of yogurt and garnish with pomegranate seeds. Drizzle with more honey if you like. Serve warm. If you are new to orange blossom water, start with a little to acquaint yourself. Leftovers reheat in the microwave—about 1 1/2 minutes on high per serving, stirring once in between. GLUTEN-FREE: Use quinoa, preferably red for a visual treat, instead of bulgur, and cook for 18 to 20 minutes. 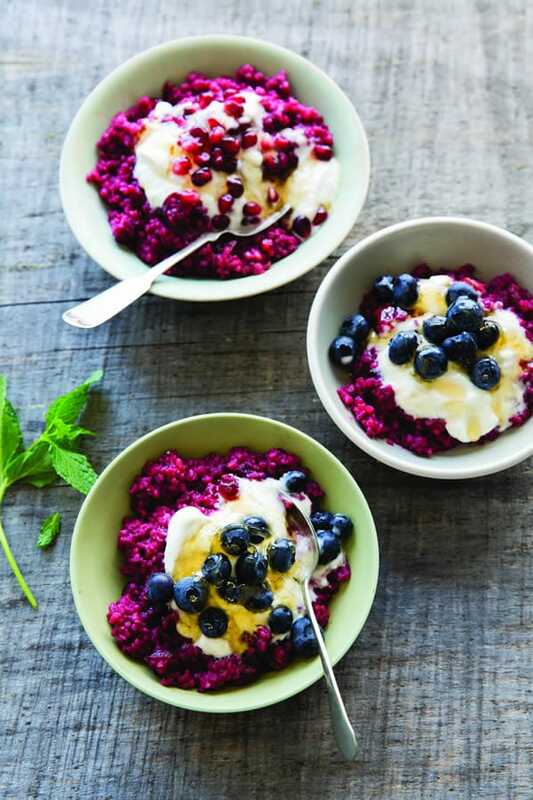 VARIATION: Use cranberry (instead of pomegranate) juice and 1 to 2 tablespoons honey (instead of 1 teaspoon) for the bulgur, and whole milk or part-skim ricotta (instead of Greek yogurt) to finish. Reprinted with permission from Simply Ancient Grains by Maria Speck, copyright © 2015. Published by Ten Speed Press, a division of Penguin Random House, Inc. Photography © 2015 by Erin Kunkel. Raised in Greece and Germany, Maria Speck has a lifelong passion for whole grains. She is the award-winning author of the new Simply Ancient Grains and Ancient Grains for Modern Meals. Maria’s first cookbook won multiple awards, among them the coveted Julia Child Award from the International Association of Culinary Professionals. Both the New York Times and the Washington Post named Ancient Grains a top cookbook, and Cooking Light magazine included it among the 100 best cookbooks of the past 25 years. Simply Ancient Grains was selected as a top cookbook for 2015 by the Washington Post, the Huffington Post, and Sweet Paul, as well as on NPR’s Here & Now. It also won an M.F.K. Fisher award, first prize in the book category. You can find out more at MariaSpeck.com, and follow her on Facebook, Twitter, and Instagram. 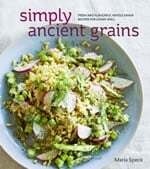 I used Maria Speck’s book “Ancient Grains for Modern Times” for several years. I love her recipes. It is my go to cook book. If you haven’t tried it, I, highly, recommend it. My kids, 11 & 12, love the meals from this book. This is food as it is meant to be…delicious, whole, and clean. Dear Chris — thank you so much for your wonderful compliments for my first book, and for taking the time to write. I can’t tell you how happy notes like this make me — this is what cookbook authors live for. I love especially that you cook for your children from my book and that they enjoy the meals. All my recipes are tested by the kids of our friends who come to dinner—and if they don’t approve with 9 out of 10, I go back to the test kitchen. My new SIMPLY ANCIENT GRAINS is focussed on time-strapped families and busy professionals because so many people want to eat better. Thanks again for writing. This recipe sounds delicious. Would it work well with other grains as well?